The Massachusetts men’s soccer team held its Atlantic 10 tournament fate in its own hands on senior day in Saturday’s season finale. And they would need overtime to seal that fortune against Fordham University. Locked in a defensive battle and ending regulation in a 0-0 draw, the Minutemen (5-12-1, 4-3-1 A-10) headed to overtime with the mindset of upsetting the Rams (6-7-4, 4-3-1 A-10). That’s when freshman defender Casey Hamill found some space on the left side of Rudd Field in the offensive zone, jetting to the net where he buried the overtime game-winner from eight yards out past the Fordham goalkeeper to secure a 1-0 win in the 97th minute. 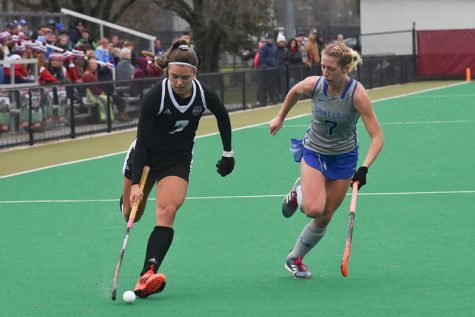 The game-winner marked Hamill’s first goal of the season and it could not have come at a more opportune time for the Minutemen, who were battling for their A-10 playoff lives, needing a win to keep their hopes alive. With the win, UMass secured the No. 5 seed and will travel to Fairfax, Virginia where the conference tournament is hosted. 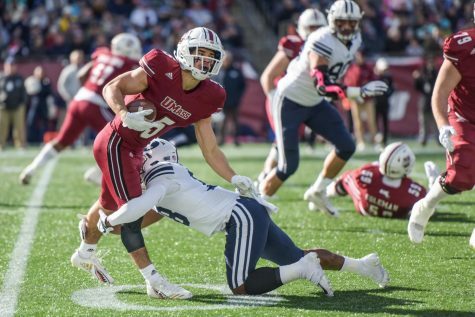 Junior defender Josh Jess, who led the Minutemen’s backline all season long, was excited for UMass’ return to the tournament after it missed out on a tournament spot last year. Clinching their spot was no easy task for the Minutemen Saturday, who had their hands full against the Rams. The first half saw a combined 15 shots from both teams, but the only real opportunity came for UMass when a Samuel Asamoah shot rang the left post. The rest of the half saw the ball change possessions multiple times as each team tried to move the ball forward to no avail. 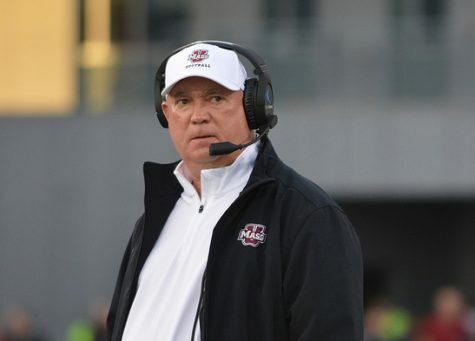 Coach Fran O’Leary said he was pleased with UMass’ effort despite the lack of offense in regulation, acknowledging Fordham was a tough opponent. The Minutemen’s confidence began to grow in the second half as they outshot Fordham 7-to-2, putting continuous pressure on the Rams defense. Fordham hung tough however, bending but not breaking. 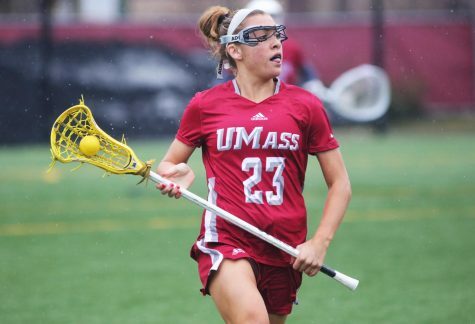 Its defense stifled many UMass opportunities, clearing the ball deep. 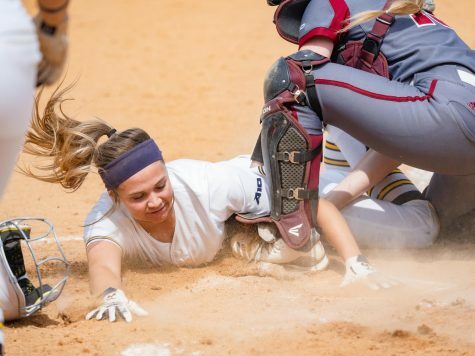 The Rams themselves also created a few offensive opportunities, but stout defense from both sides kept the scoreboard unmarked at the end of regulation. With a five-minute intermission before the start of overtime, O’Leary said he gathered his troops on the field, telling his team to continue fighting. “It was more of the same. We outshot a very good Fordham team… So just keep doing the same things, work the keeper and carry on,” said O’Leary. 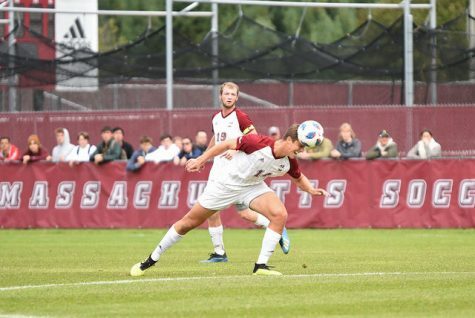 The Minutemen continued to pressure Fordham in overtime and the Rams defense finally broke, allowing Hamill some space to convert on the sudden death winner. 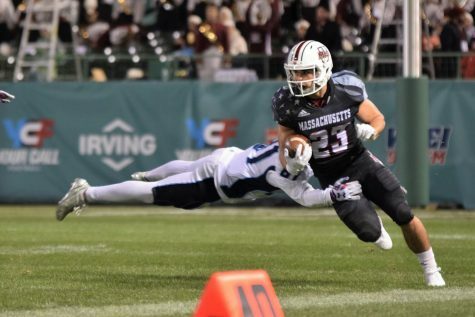 O’Leary said he was proud of the Minutemen’s hard-fought second half of the season, allowing them to claim the fifth seed after being picked to finish 12th in the preseason poll. 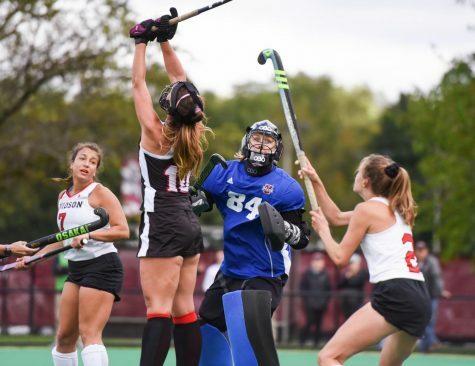 After a slow start to the season, losing its first six games, UMass has flipped the script earning their first playoff appearance since 2013. UMass has now earned points in five of its last seven games. 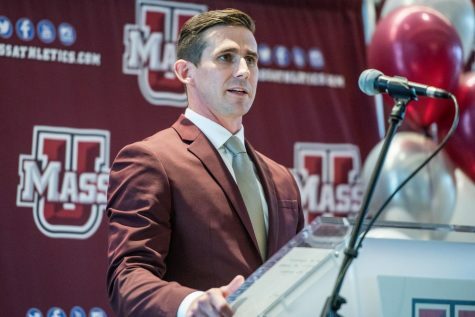 Hamill stressed that this built-up momentum will be important for UMass as the team prepares for its first-round matchup in Virginia. As announced Sunday, the Minutemen will face No. 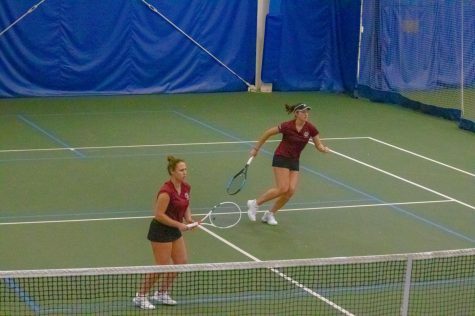 4 seed Fordham in the first round in a rematch of Saturday’s season finale.